Vipul Bansal didn’t believe he was getting enough vitamin D. He’s not alone. Although figures vary wildly, somewhere between 10 and 80 percent of Americans are vitamin D deficient. Bansal, Professor of Applied Chemistry and Environmental Science at Australia‘s Melbourne Institute of Technology, sought a solution. The easiest, obviously, is just to get more sun. But in doing so, he understood that the easiest solution often led to more problems, like skin cancer, wrinkles, and even cataracts. “I was after a sensor that could tell me how long to spend in the sun to get enough vitamin D, but not damage myself with a potential skin cancer,” he told Discover Magazine. Solutions, of course, already existed. These, though, are expensive, often lack portability, and need near-constant calibration. So Bansal went to work. He and a team of researchers first created a special ink that monitors UV exposure. It’s made from phosphomolybdic acid. The ink starts invisible, but slowly turns color with UV exposure. UVA turns the ink a light, gray-blue. From there, Bansal’s research team then set out to create a cheap UV sensor. Their solution, though crude, works. The team loaded an everyday fountain pen with their newly developed ink. They then drew faces on a circular piece of paper ranging from happy to sad. With prolonged exposure to UV rays, the ink gets darker, thus highlighting the face on the paper. Too much exposure darkens all the faces, including the sad face on the end. The goal, obviously, is to leave the sun — or cover up with additional clothing or sunscreen — once you’ve reached the desired level of sun exposure for the day. It’s a bit rough in its current stages, but the disposal sensors will be streamlined and perfected over time. 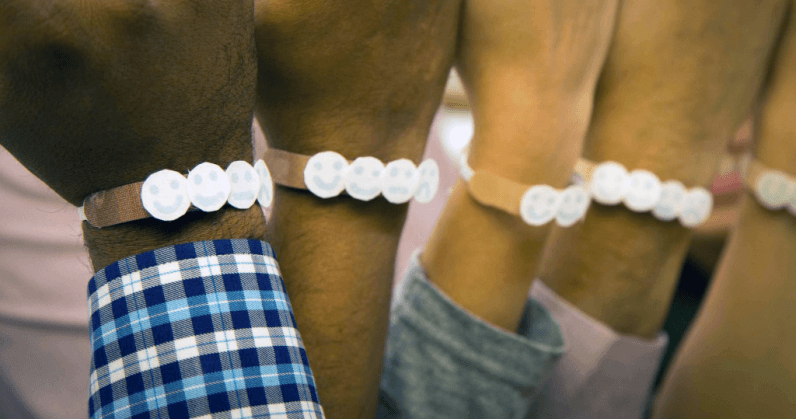 “We can print our ink on any paper-like surface to produce cheap wearable sensors in the form of wrist-bands, head bands, or stickers, for example,” Bansal said. When ready for mass production, the sensors will only cost around $1, Bansal estimates.